When I decided that Elijah was going to be buried, I requested that his coffin be a plain white box, delivered to our home so that we could personalise it. This was one way we could honour our son and brother, and in doing so it lessened the awfulness of a baby-sized coffin. When the box first arrived, it was at the end of a traumatic day for me, so my dad moved the coffin to the boot of Gwenda’s car so that I didn’t have to see it right away. In the morning, he was by my side when I first saw it. There’s something very wrong about a small coffin. Looking at the box, and knowing that this was the container for Elijah’s little body, simply made it worse. Once I had seen the box, I left it on the table in our shed, and gradually it became part of our family’s familiar landscape. The girls started to play with the box, placing toys in it as a boat. Then it was a baby bed for a short while. As a family, we talked about how it was for Elijah’s body, and his body was the size of big baby. I had bought some special coloured permanent pens on my walk into town with Elijah on his last day, and I pulled these out and gave them to the girls so they could decorate the coffin. 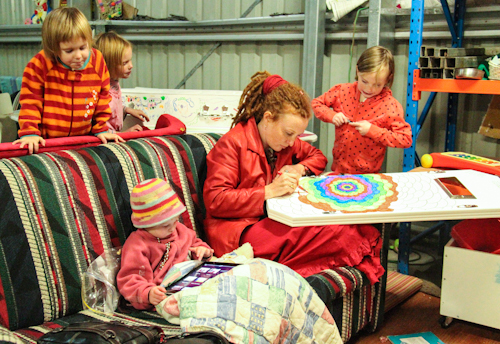 Aisha and Brioni were allocated the long sides, and Calista and Delaney received the ends. I reserved the lid for myself. When the girls plead with me to also add their mark to the lid, I confessed my selfishness and said that this was one thing I was not going to share. One night, I sat down with a black pen and started a flower design with an ever-increasing petal size. My dad was beside me, talking about his workplace, his colleagues and the idiosyncrasies of the bureaucracy he works within. My mind was transported to Sydney as I drew the chrysanthemum, and slowly Dad’s stories became interwoven with the drawing. Afterwards, whenever I looked at the picture on the coffin, I remembered the mental pictures I had created at the time, instead of Elijah’s lifeless body. The coffin-lid sat in black and white for several more days until I ran out of time and needed to return the coffin to the funeral home. Tonight, I started colouring it in and stayed up late to finish it. Perhaps I wanted to delay Elijah’s design because I know it is leading to a final good-bye — something I never wanted to have to do. I find the intricate drawing and then the colouring-in of the coffin-lid therapeutic for my grieving spirit. I deliberately worked through a rainbow of colours in each ring of the chrysanthemum — both as a tribute to Elijah Rainbow, and also to make this terrible, ugly box as beautiful as possible. If it looks lovely, it comes at too high a price. Brioni adds the final touches to her side of Elijah's coffin. 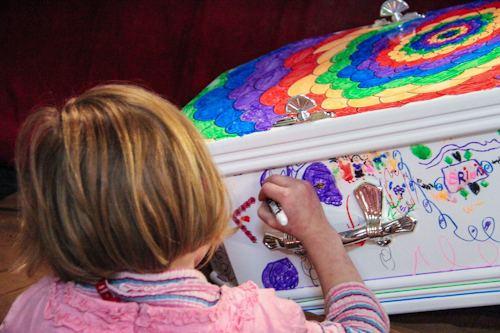 When we're done, Elijah's coffin is so colourful — decorated by loving hands on all sides. At the top of the lid, I wrote out a favourite song of ours from the Rainbow Gathering where Elijah was born and from which he received his colourful name. The song is meaningful on so many levels, and I wish I had a proper recording of it to listen to. My soul will never die. I am so glad it was so beautifully decorated. I am so sad that it was something that you all had to do. Its very gorgeous, and yes the price was far too high. I’ve only just seen this now and I am crying. I am so glad that you decorated his coffin. It is beautiful and what a precious resting place for Elijah’s body. He was the most loved baby boy. Have only just seen this post and all I can say is that my heart expands for you. You are such a beautiful family. but your colors dance through space. I feel its beauty in its sadness.